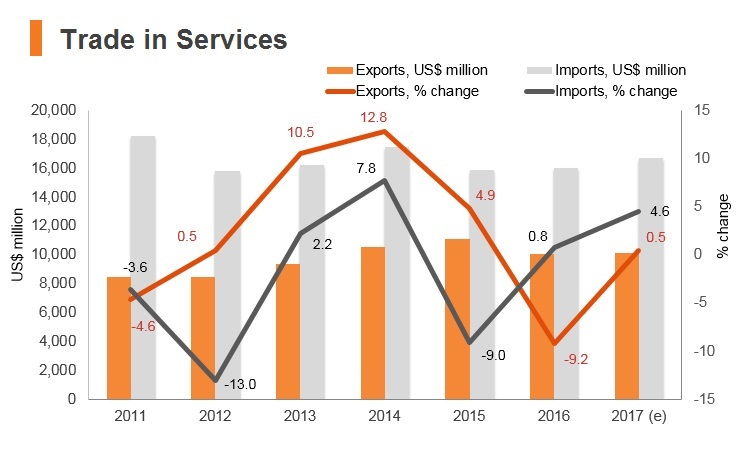 While hydrocarbons are the dominant sector in Iran and account for the majority of exports, growth in recent years has increasingly been based on non-oil sectors as well as a short-lived recovery in consumption and investment demand. 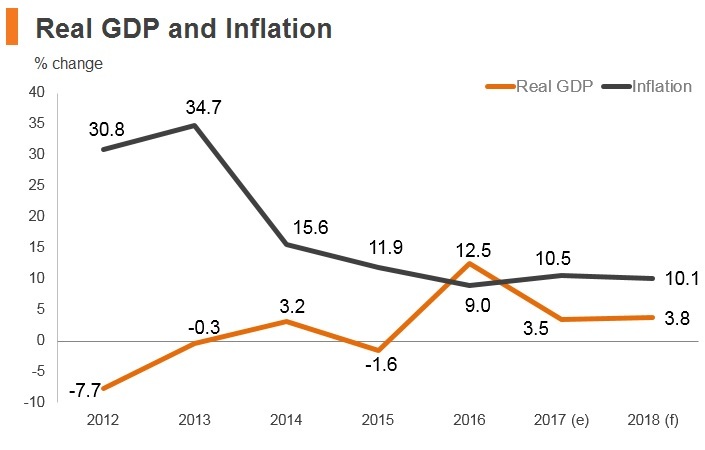 The Iranian economy bounced back sharply in 2016-2017; however, by the second half of 2018, Iran’s economy was under significant negative pressure as fresh economic sanctions undermined investor sentiment, fuelled inflationary pressures and weakened rial. 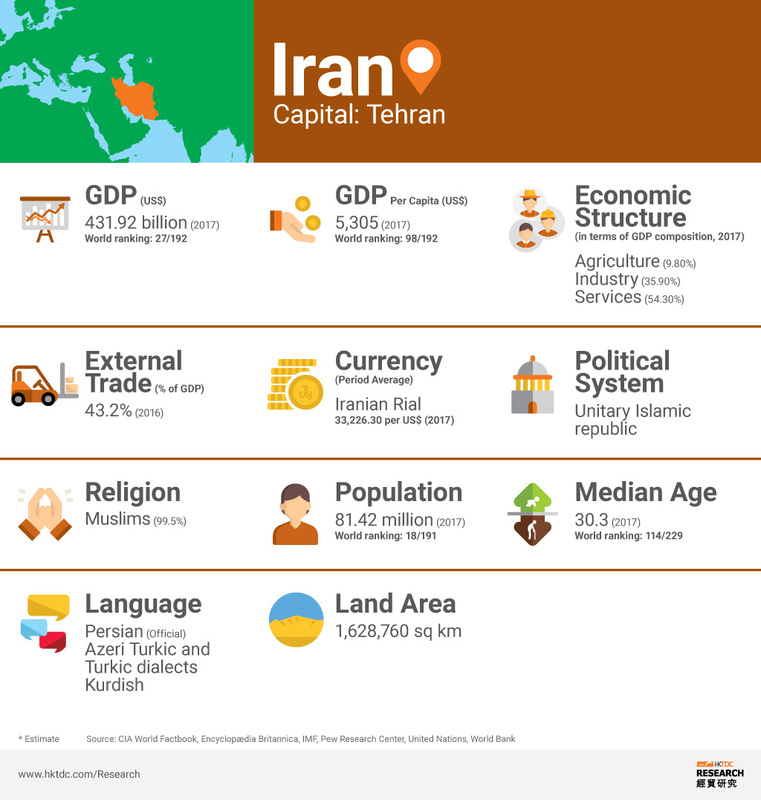 In the medium-to-long term, growth prospects will rely on the pace of Iran’s reintegration with the global economy in banking, trade and investment and the implementation of key structural reforms. After years of negotiations, world powers reached a deal with Iran on limiting Iranian nuclear activity in return for lifting of international economic sanctions. International economic sanctions were lifted after the UN nuclear watchdog, the IAEA, confirmed that Tehran had complied with its promises to scale back its nuclear activities. The US Senate approved a ten-year extension of the Iran Sanctions Act, which penalised American companies for doing business with Tehran. US President Trump announced the US withdrawal from the 2015 international deal on Iran's nuclear programme and the re-imposition of US sanctions on Iran. 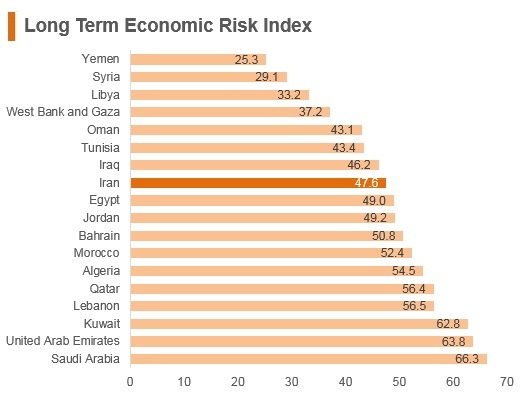 International sanctions have presented the most major barriers to trade growth in Iran. Although Iran has been under sanctions of varying severity imposed by the US since the Islamic Revolution in 1979, these were significantly widened and joined in on by the EU and the UN in 2011 as a response to the country's continuing nuclear programme. Sanctions have had a severe and widespread impact on Iran's economy, specifically targeting the development of nuclear facilities and the procurement of arms, while also including a ban on the involvement of Western companies in the oil and gas industry, the prohibition of oil exports to key developed markets such as the US and EU, and the exclusion of the banking sector from the international finance industry. Even though most sanctions were lifted in 2016, US primary sanctions continued to obstruct international trade by preventing the use of US dollars for transactions with Iran. 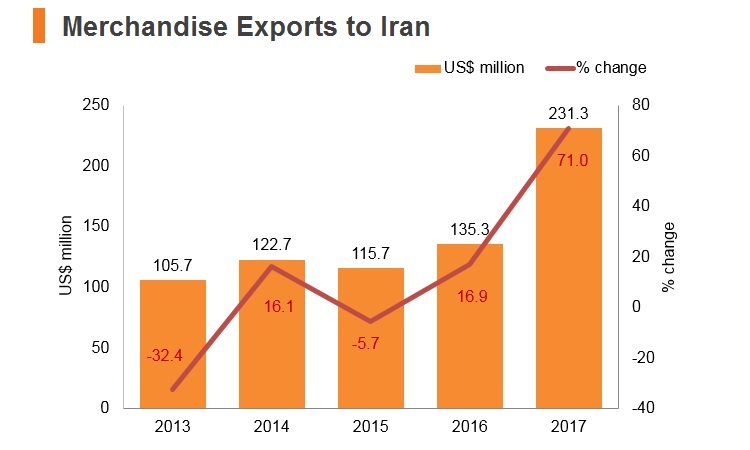 International trade in Iran has been shaped by the sanctions regime from which the country began to emerge from in 2016. The imposition of sanctions, led by the EU and the US, severely depressed trade volumes for Iran's key commodity export, oil, and prevented investment in the hydrocarbons industry, hindering economic growth. 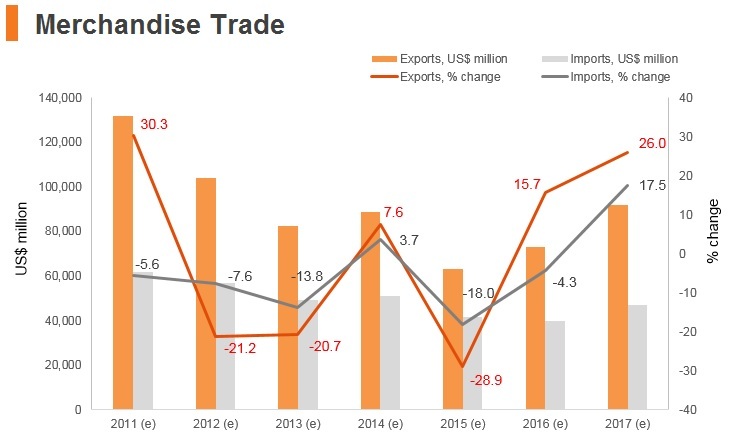 Sanctions have also halted the use of dollars for international trade, and driven the focus of trade flows towards Asian countries. US President Donald Trump’s decision in May 2018 to withdraw from the 2015 nuclear deal has paved the way for the re-imposition of US sanctions against Iran, with the first phase beginning on August 7, 2018. The first round targets Iranian purchases of US dollars, metals trading, coal, industrial software and the Iranian autos sector. The second batch of US sanctions that are set to be re-imposed on Iran will target its banking system and oil exports. These sanctions are expected to be implemented on November 4, 2018. 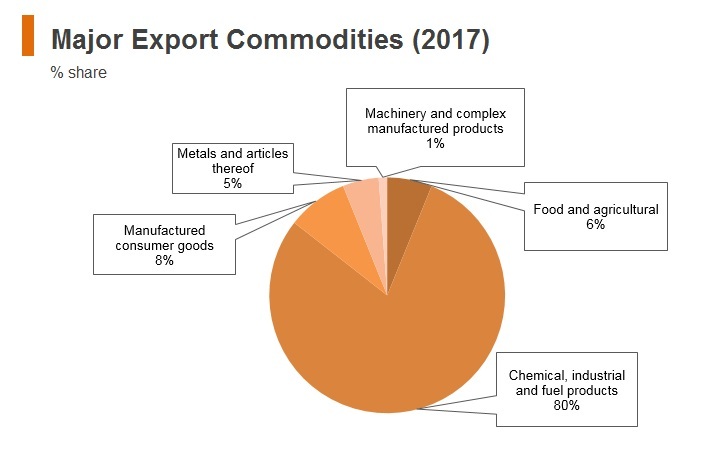 Trade volumes in Iran are dominated by high-value hydrocarbons exports, which are the main drivers of economic growth and the major sources of government income. Import demand in Iran is also largely driven by the oil and gas sector. 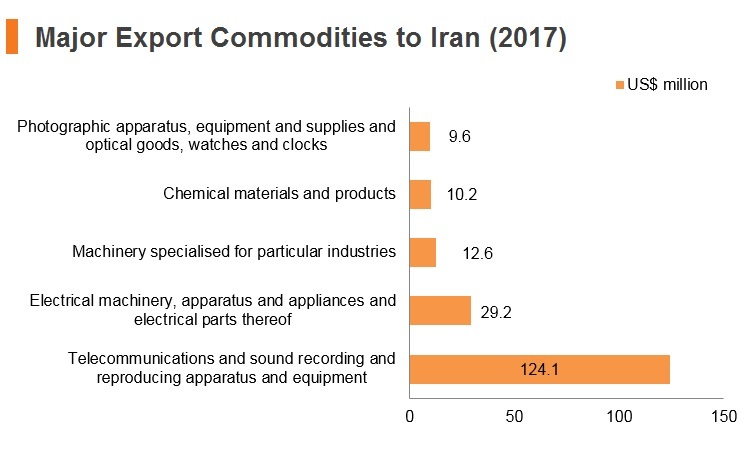 Iran's vast natural resource wealth nonetheless suggests that potential trade volumes could be far higher than the current level. 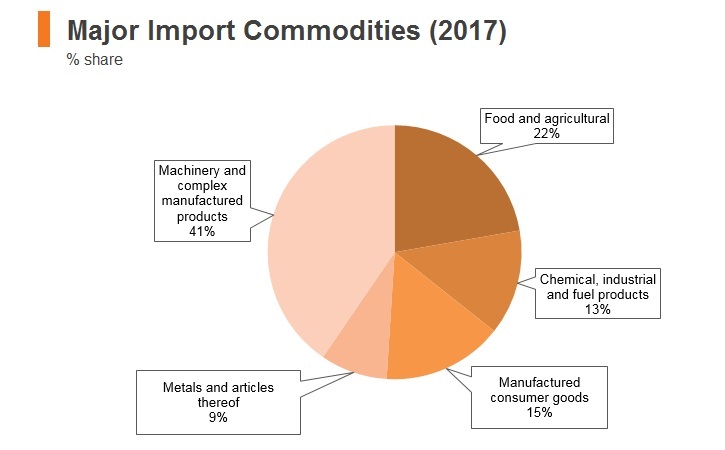 Trade flows are hindered by considerable average import tariff rates, standing at an estimated 15.2% (in 2016), which is the eighth highest globally. This is partly due to the fact that Iran has yet to become a full member of the WTO, as its membership has been held up by US vetoes and slow progress on accession once its application was accepted in 2005. 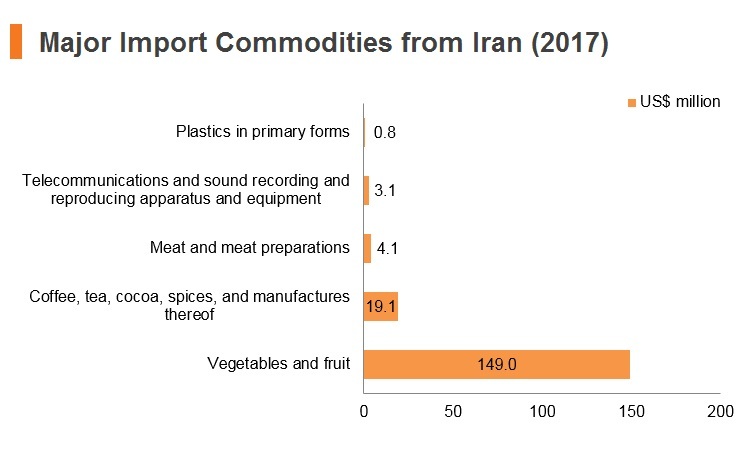 The Iranian government has traditionally applied high tariffs on imports to protect and encourage growth in domestic industries, but this significantly increases the costs of imported inputs for businesses and reduces Iran's competitiveness. 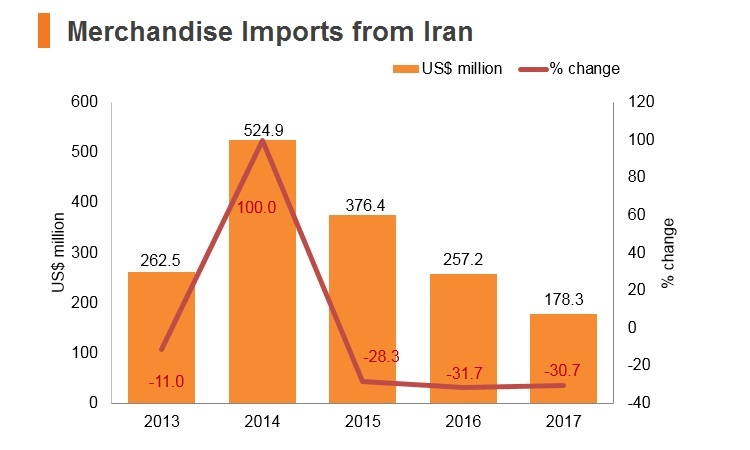 The inability to use US dollars for trade transactions significantly increases the difficulty of selling into and operating in the Iranian market, as payments have to be made in EUR or CNY instead. Firms doing business in Iran risk severe consequences, after US President Donald Trump’s first batch of secondary sanctions against the Middle Eastern country came into effect in Q318. August 6, 2018 marked the first of two deadlines that the US president gave companies to ‘wind down’ activities in Iran when in May 2018, he announced that he was pulling the US out of the Iranian nuclear deal – officially known as the Joint Co-operative Plan of Action (JCPOA). The JCPOA was agreed between Iran and China, France, Russia, the UK, US and EU in 2015. While the US has long maintained its tough stance on US persons dealing with Iran, the JCPOA meant that it agreed to lift its so-called secondary sanctions – those that apply to non-US persons and entities engaged in Iranian transactions. Those are the sanctions now being re-imposed. However, with the EU expected to enforce a so-called ‘blocking regulation’, a statute that makes it illegal for any EU company or person to comply with those US sanctions, EU firms will face significant challenges when it comes to doing business in Iran and complying with the US requirements. Syria-Iran Preferential Trade Agreement: Syria is not a viable trade partner while its civil conflict continues, and therefore, the FTA is unlikely to offer attractive trading opportunities for many years, even if the war ends. 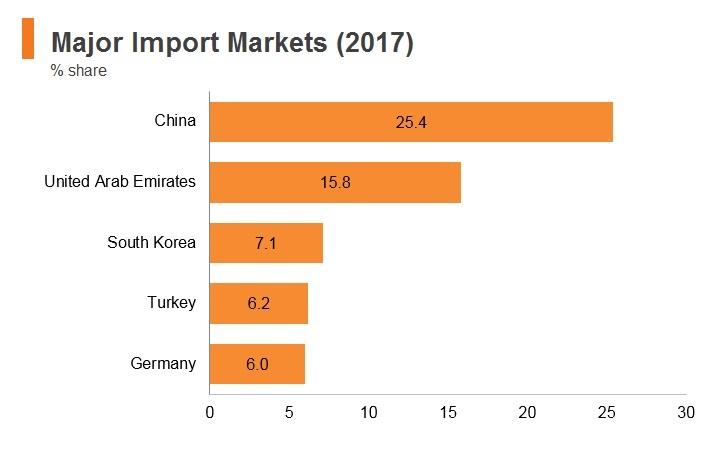 Gulf Cooperation Council (GCC): Iran is reliant on GCC states for imports, which flow through the UAE's better connected ports, and trade will pick up once sanctions are lifted. Iran is currently negotiating an FTA with the GCC. Pakistan-Iran: In December 2016, Pakistan and Iran started negotiating an FTA with the resolve to complete the negotiation process and achieve the objective of enhancing bilateral trade for the betterment of people of both countries. As of May 2018, negotiations were ongoing; however, the aim was to implement the agreement by June 2018. Indonesia-Iran: Indonesia is a large economy that could provide a significant market for Iranian oil exports. 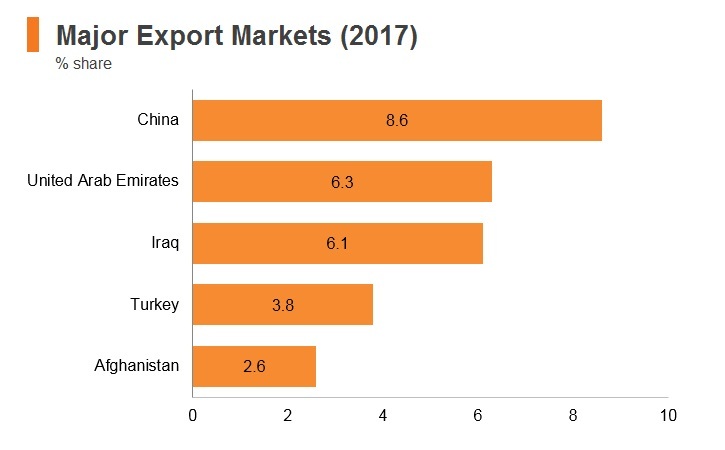 Turkey-Iran: Turkey is conveniently located next to Iran, a top-five trade partner for Iran for both exports and imports, which offers a huge market for Iranian hydrocarbons. A successful trade agreement between the two countries would consequently open up considerable opportunities for businesses to take advantage of. Iran offers one of the most difficult markets in the world for foreign investors to navigate. To a large extent, this is due to the international sanctions placed on the country, which precluded investment by Western businesses in many sectors, including the valuable oil and gas industry, and continue to severely limit access to financing for firms based in Iran. 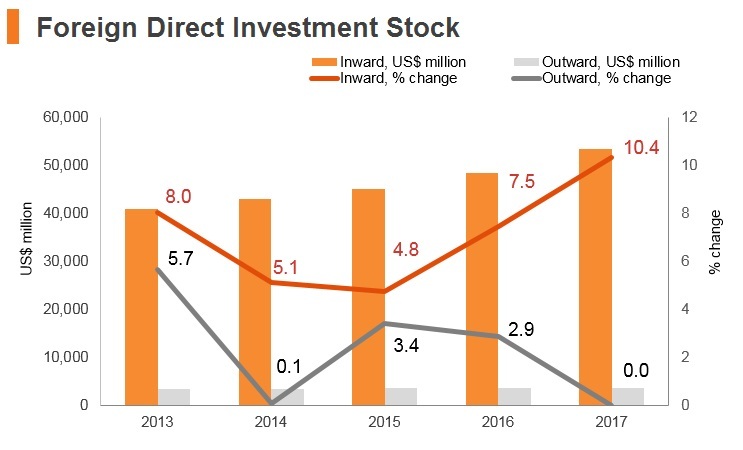 That said, FDI inflows have continued during the sanctions regime, particularly from China, while South Korean and Indian firms have also been among the first to secure investment in infrastructure development following the lifting of sanctions. US-imposed sanctions primarily focused on Iran's economically vital oil and gas industry and its financial sector, specifically preventing Western companies from involvement in the financing of oil exploration, production and refining. Iran's banking industry was excluded from global financial markets through the banning of trade in precious metals from Europe and expelling Iranian banks from SWIFT. 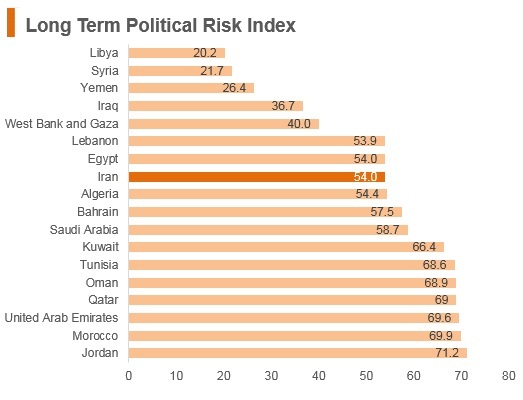 By targeting these sectors, in particular, the sanctions imposed a blanket ban on investment in Iran by Western firms. 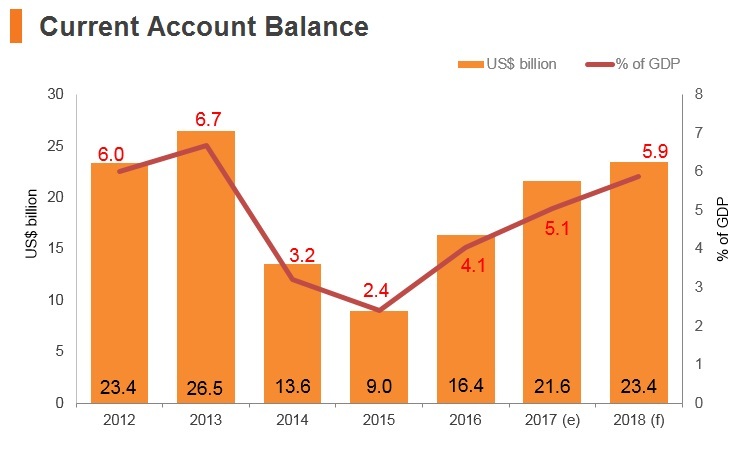 Though most sanctions have now been lifted, US primary sanctions remain in place, causing difficulties for businesses with US interests and preventing the use of US dollars for transactions. Despite ongoing talks between Europe and Iran aimed at salvaging the nuclear deal and keeping European businesses in Iran, major European companies are already leaving the Iranian market in order to avoid US sanctions. 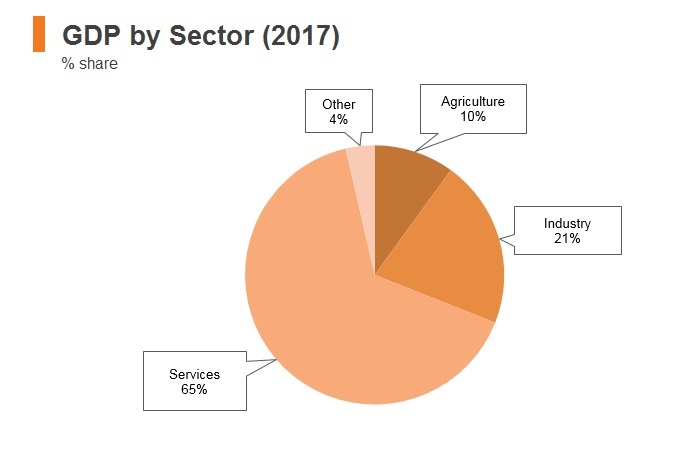 Foreign investment is currently coordinated under the Foreign Investment Promotion and Protection Act (FIPPA), which was introduced in 2002. 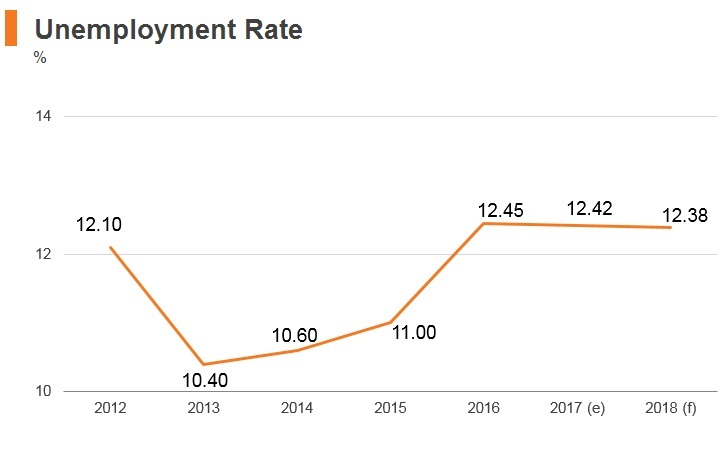 The saturation of the Iranian labour market means that the employment of foreign nationals is not encouraged, and the percentage of foreign workers employed in a company may be capped at 20%. The process of employing expatriate staff is made slightly easier if investment is through the 2002 FIPPA, which allows work and residence permits to be granted for foreign investors, directors, experts and their immediate family members. Companies wishing to employ foreign workers in Iran for more skilled positions must apply for work permits and seek permission from the Department General for the Employment of Foreign Nationals. Employment permits will only be granted if certain stipulations are met, namely that there is a lack of expertise for the position among Iranian nationals, the foreign national is qualified for the position, and the expertise of the foreign national will be used to train Iranian workers who will subsequently replace the expatriate. Work permits are issued for a period of one year, and cost USD130 to be issued or renewed (a renewal also lasts for one year). Citizens of the US, the UK, Canada and some South Asian and Middle Eastern countries must obtain visas in advance, and independent travel may be limited. Israeli citizens cannot travel to Iran, and citizens of third world countries who have visited Israel may be refused entry to Iran. Restrictions on women when it comes to clothing and social activities can make life challenging for expatriates. Businesses will likely have to offer higher remuneration packages in order to entice skilled expatriates to work in Iran. Iran fell deeper into the economic quagmire in August 2018 when the first round of US sanctions came into effect. Moreover, oil exports have started to decline sharply ahead of the November sanctions, which will include secondary sanctions against countries that buy Iranian oil and the country’s banking industry. As a result of rapidly deteriorating economic conditions, much-needed structural reforms and re-integration with the international community will be difficult to effect. 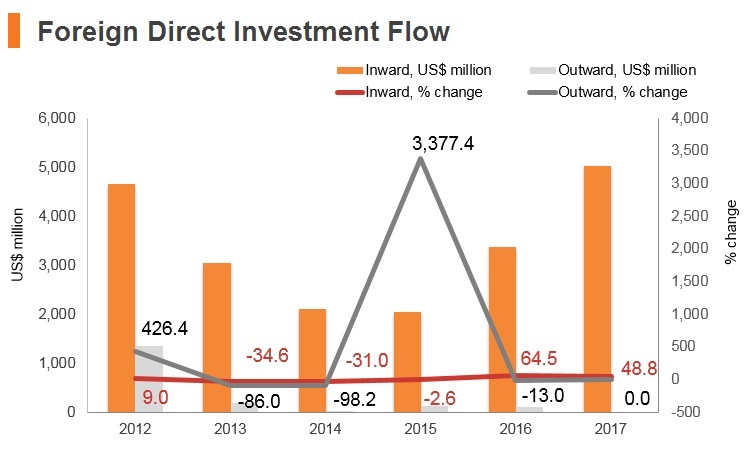 Furthermore, fiscal deficits will be sustained over the coming years, primarily on the back of lower oil revenues and gradually increasing spending. 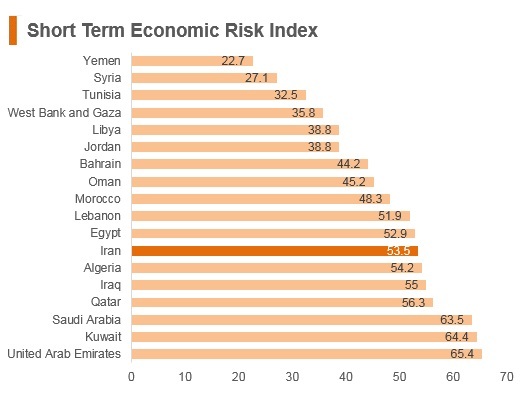 That said, Iran's long-term economic outlook is one of the most promising in the MENA region, particularly in the event that the country can secure sanctions relief, against the backdrop of a positive consumer story. However, the inability to fully exploit Iran's enormous oil and gas wealth and a challenging operational environment will keep a lid on real GDP growth over the next decade. Iran's operating environment is facing considerable setbacks resulting from the decision of US President Donald Trump to reintroduce secondary sanctions, all but ending the nuclear agreement reached in July 2015. While the other signatories to the agreement - the EU, Russia and China - have tentatively agreed to continue upholding it, most improvements to Iran's economy and business environment over the last three years are likely to be erased. 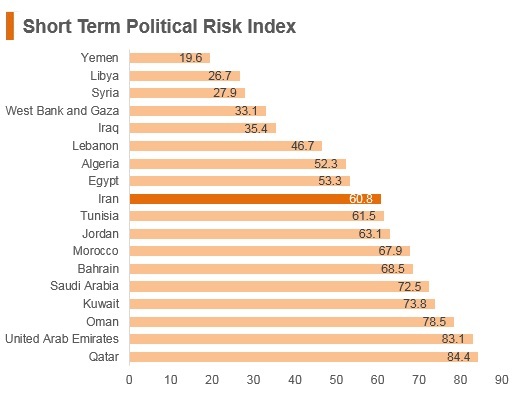 Doing business in the country will become more difficult once again for Western firms, while structural risks including obstacles to trade, regulatory restrictions, onerous taxes, stringent labour laws, and widespread corruption are likely to worsen.